Most movie theatres in the world are now digitised. 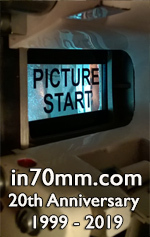 Analogue projection of movies is now a fairly rare event, limited to a few theatres in each country. Film laboratories have closed, an entire aspect of the cinema industry has vanished. Studios and film archives will presumably guard their precious prints, and print requests are becoming substantially harder than it was some few years ago. We are therefore particularly happy and proud to present so many unique and rare movie experiences during our 10 day festival. The Norwegian film institute proudly presents the 12th Oslo 70mm festival. The program is a mix of vintage original prints, blow-ups and restored classics. This festival, dedicated to a movie format that was introduced more than 50 years ago, is a dream for many movie fans around the world. Today, movies and cinemas have reached a time of change – a change from film based to digital cinema and a change in the way movies are felt and understood. The program will consist of 15 different feature films on 70mm. 2 screenings each weekday, 2 -3 titles in the weekends. All films in original language. Restored and recent struck prints without sub titles, original prints with Scandinavian subtitles. German language movies with English subtitles.